As on Friday 3 November the conditions were: showery and Dead6, rail true. 5mls rain forecast Friday, 16mls race day. 1.37 p.m. R3 1 Fortaleza (4 m Darci Brahma – Bunyah, by Distant View) – Troy Harris; produced a good effort for fourth, on deteriorating heavy ground, in the Maiden 1400 metres on 27 October at Pukekohe, and contests the $10,000 Maiden Fillies & Mares 1600 metres. Prior to that she recorded the fastest last 600m (36.7) on Slow9 footing when sixth in the Maiden 1400 metres on 20 September at Te Rapa, and rates an each way chance. 2.49 p.m. R5 10 Ruby Armani (5 m Makfi – Trujillo, by Saint Ballado) – Mark Du Plessis; was scratched off heavy footing last Friday at Pukekohe, and resumes in the $25,000 Rating 75 1300 metres. 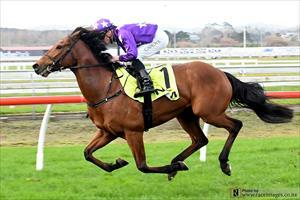 Close up when fifth in the Auckland Thoroughbred Breeders’ Stakes (Gr. 2, 1400m) last November, she is lightly raced, goes well fresh, has performed well for this rider and capable of getting into the finish with luck from a wide draw (14). Genuine slow ground may see her reserved until the following weekend. 4.09 p.m. R7 11 Makarios (5 g Makfi – Silken Power, by Woodman) – Mark Du Plessis; ran very well for a fresh-up third on Slow8 footing in the Rating 65 1200 metres on 14 October at Matamata, with Du Plessis aboard, and drawn barrier one in the $22,500 Rating 65 1400 metres. He has raced well here previously, finishing second on Slow9 over 1300 metres, and although meeting a stronger field he should go well.